Even though libcom is primarily a UK based, English language website, there are still tonnes of articles from and about other parts of the world and in other languages. As the resident China-based blog, I've pulled out a few gems from the library about China, both contemporary and historical. Translation of an autobiographical essay by Tang Shui'en, mainland Chinese anarchist musician and activist, recounting his path from childhood in 1980s rural China to participation in Wuhan's pioneering punk scene since the late 1990s, interaction with overseas anarchists and other radicals, and experimentation with independent media and an autonomous youth center. Wildcat analyse the situation, role and struggles of women in China from the Cultural Revolution until 2007. Another Wildcat article giving the history and an analysis of internal migration in China from the 1950s until 2007. Prol-Position article from 2006 on development and class struggle in China. Aufheben's excellent account of the development and transformation of China and the Chinese working class from the time of Mao until 2008. Aufheben article from 2006 on the capitalist restructuring in China, and the possibility of China becoming the world's leading power in the 21st century. Yet another Wildcat article from 2007, analysing the history and current situation of urban state workers in China, the employer attacks on them and the workers' responses. A pamphlet by Mouvement Communiste and Kolektivně proti kapitálu about the wave of strikes that swept the industrialised coast of China in the summer of 2010. Detailed study into the rise and development of the Chinese 'ultra-left' during the Cultural Revolution which found itself often in highly confrontational opposition with the ruling Chinese Communist Party. An interview with the academic Arif Dirlik, who researched the pre-1949 Chinese anarchist movement, with accompanying biography and selected bibliography. Article by Nohara Shirõ on the political movement that grew out of student demonstrations in Beijing on May 4, 1919. Burt Green analyses the events of Tiananmen Square and their consequences. 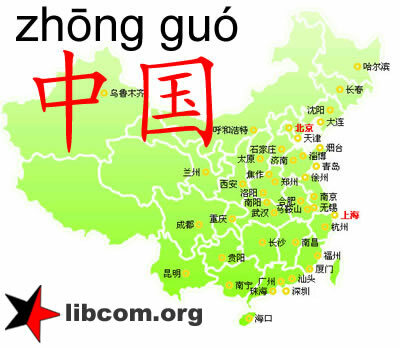 There is now a Chinese language (中文) section of the website, which I am constantly adding to, making it easier for native Chinese speakers to use libcom. As someone that is terrible at speaking any Chinese dialect and can barely read Chinese, there is only so much I can add. So if there are any native Chinese speakers reading this, then please add what you can to the library. Hey, thanks for posting this, that's a good selection, even if I say so myself. can anyone comment on Lucien Bianco, Origins of the Chinese Revolution, or Harold Isaacs, Tragedy of the Chinese Revolution? I really can't recommend this enough. Anarchism in China 1900–1921, by E. Staburova (Moscow, 1983, 188 pp.). Gregor Benton, 2014 - 1288 pp. Isn’t there a French version nearing completion? A sequel about class struggle in the Pearl River Delta, set against the backdrop of deindustrialization, is forthcoming and is currently being translated into English.